His bird’s eye imagery captures the stark juxtaposition between rich and poor neighbourhoods, separated only by a few hundred meters. Slums versus mansions. Dilapidated homes versus sky rises. Technically speaking, this concept of spatial inequalities is what our latest Divided Cities publication looks at: analysing spatial income segregation within and across countries. 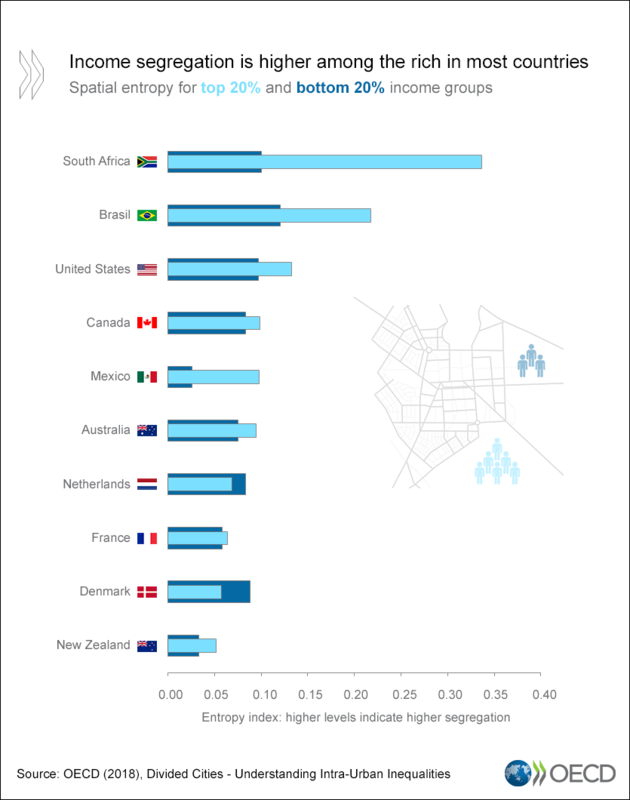 For instance, income segregation in Brasilia – the most segregated city in Brazil – is seven times higher than in Auckland – the most segregated city in New Zealand. In the United States, average income segregation levels in Memphis are more than twice as high as Portland’s. However, not all income groups are equally likely to be segregated. With the rich always trying to “keep up with the Joneses,” they have the strongest tendency to live among themselves. For example, in South Africa, the rich are three times more segregated than the poor. The situation is the opposite in Denmark and the Netherlands, where, although income segregation is much lower than in other countries on average, the poor tend to be more segregated than the rich. This is likely related to a high concentration of social housing in specific neighbourhoods. This truly highlights the importance of how transport and housing policy, together with local services, are designed in our cities. Urban design is intrinsically linked to local and national social policies. Spatial inequalities are not only about income. Inequalities can be seen and felt in many different forms. Quality of housing, education, jobs, healthcare and services are all inter-linked. Take jobs and public transport. Indeed, the neighbourhood you live in affects what bus line you take, which affects what job you have. For example, in the US, jobs typically carried out by minority groups are often located in areas lacking good public transportation. This disadvantage in access can potentially translate into higher unemployment for minorities. What about health and spatial inequalities? Recent research has shown that there can be a 20-year difference in life expectancy within rich and poor areas in various cities, including London and Baltimore. Health is one of the pivotal indicators of well-being. With such stark differences in incomes across urban neighbourhoods, we are severely impacting the health and life span of our people. Something needs to be done to address this. In order to tackle the issues of well-being and inequality, we need to create economic growth that is distributed fairly across societies and creates opportunities for all. This is what the OECD Inclusive Growth Initiative is all about: going beyond GDP to ensure that gains in economic development translates into better standards of living and actually improves lives. Cities are at the heart of this fight. Local leaders around the world have recognised that inequalities are not simply side effects of growth but rather the result of national and local policy choices. Several Mayors, including those bold members of the OECD’s Champion Mayors for Inclusive Growth Initiative, have put in place strategies to build pathways to prosperity and expand opportunities for all. Inclusive growth in areas such as transit development, affordable housing investments, neighbourhood revitalisation, infrastructure development, or resident engagement are underway. For example, cities like Santa Monica, California are investing in making renewable energy affordable by creating utility companies with neighbouring cities, so that a wider range of residents are able to participate in the low-carbon future. In Stockton, California, the Mayor is piloting a universal basic income scheme to support very low-income households that are vulnerable to being left behind. San Jose, California is experimenting with affordable housing bonds and striving to address the city’s affordable housing shortage. Across the Atlantic, we see that Paris, which sought external ideas by launching an international competition on how to redevelop 23 sites across the city to address housing needs, is tackling worsening inequalities and climate change. Lastly, we can turn to the The Promise of Seoul, which is a comprehensive, inclusive and people-centred plan to address climate change. Inclusive climate response has also helped Seoul create green jobs for those suffering from long-time unemployment. In aiming for inclusive growth, we must couple building physical infrastructure and social infrastructure. Bristol has joined forces with Oxford University’s Inclusive Cities Project to further efforts to become an open city, one where migrants are welcomed and feel supported, and are able contribute to the city’s diversity, creativity, innovation, and inclusive goals. Opportunity exists to reverse structural inequalities and create inclusive societies. We are now presented an occasion to take decisive action and choose the kind of cities we want to see in the future. Short-term responses limited to reactionary planning are the symptom of current urban inequalities, and puts cities at risk of leaving many residents and communities left behind. In the long run, this impacts growth. We are continuously learning where inequalities are most likely to exist and persist, and who they are most likely to impact. It is time to upscale successful inclusive growth practices across cities worldwide and improve the future of citizens everywhere.